I’ve been excited for this one, despite the incredibly awkward cover. I really enjoyed Riri’s debut a couple years ago and always thought she had potential to be a take-off character, but Bendis’s work with her quickly began to meander. A wholly new creative team is sure to spice things up, though. I read some thoughts on the preview spread that came out a few days ago, and I had to agree that the dialogue felt a little to plain. Riri does begin by just very bluntly explaining that she had survivor’s guilt, but in a new #1 it’s understandable and thankfully doesn’t go beyond those first two pages. Ewing clearly has more defined plans for not just Riri, but her supporting cast as well. Xavier’s back and I honestly loved finally seeing the two of them bond, and Natalie is obviously going to play a larger role. She’s more than just an Uncle Ben figure now, but I can’t really say much more than that without getting into spoilers. I loved that Ewing puts so much emphasis on the science behind Ironheart’s fighting. If I actually used my brain and thought about what’s happening, it might fall apart (and Riri probably could have done what she does to end the fight right from the start), but I like this a lot more than the fight just depending on who punches harder. Clash makes an appearance as the villain this issue, and his characterization does feel off. He’s written as a maniacal, mustache-twirling bad guy here, where as before, he’s much more of a normal guy and closer to an anti-hero. Libranda and Vecchio are both just freakin’ awesome in this issue. The speed and spectacle of Ironheart soaring above that clouds, the fighting (both science and punches! And repulsors! ), and the conversations are all engaging. Every panel has detail given to every square centimeter, instead of just a blank background. But Matt Milla’s coloring is probably my favorite part of it all. He colors Xavier’s music, and you just totally get how it’s supposed to sound. You can hear how the rhythm just glides on your ears. As a musician, that part really floored me. I wish it had been a splash page. A flashback with Riri’s lost loved ones feels distant but comforting, and it makes it that much sadder when it ends. The lighting is impressive too, like when the lights go out and her armor glows just enough to see around her. I can’t wait for the next issue. Riri is finally given some direction, so this story actually feels like it’s going somewhere, i.e. it’s worth my time and money. The best part is it’s only building on what Bendis had laid out before (except for the Da Vinci stuff. Good. ), but not so much that this isn’t a great place for those unfamiliar with the character to start. The art team kill it, elevating every aspect of the script. 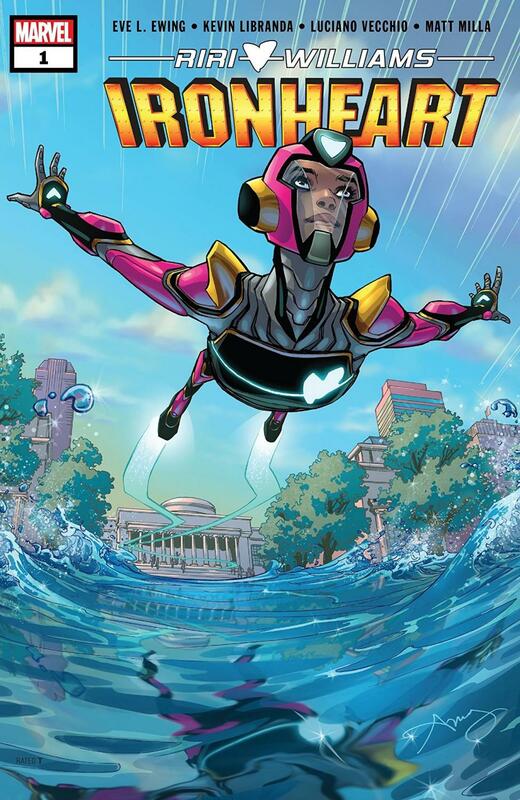 If Riri Williams wasn’t your jam before, give her another chance.